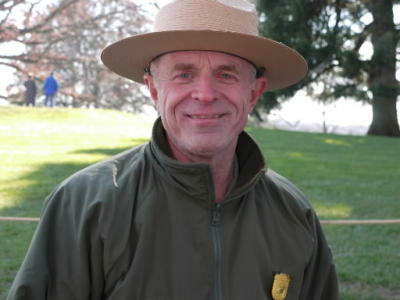 Clyde R. Bell, 61, Supervisory Park Ranger, Gettysburg National Military Park, passed away unexpectedly at his home overnight on June 19, 2013. He had been at work earlier that day. Born January 4, 1952, Clyde grew up primarily in upstate New York, where he attended high school and graduated from Eisenhower College. During his high school days he worked on a neighbor’s dairy farm. His first National Park Service job was a seasonal Park Ranger position at Saratoga National Historical Park where he portrayed both an American and a British soldier. Subsequent NPS jobs were at Desoto NP, Colonial NHP (Jamestown and Yorktown), C & O Canal NHP, and also the US Army Corps of Engineers Hartwell Lake Project in Georgia. He had been at Gettysburg NMP since 1997 fulfilling the unique and challenging job of overseeing Gettysburg’s corps of 155 Licensed Battlefield Guides as well as the park’s museum and visitor center operations and interpretive staff operations. Clyde had a critical role in the park’s upcoming nine day commemoration of the 150th anniversary of the battle of Gettysburg, which begins June 29.